Ninh Binh is a good base for exploring quintessentially Vietnamese limestone scenery. Far from Hanoi 100km and driver only 2hours with the best choice for tourists who have a short time travelling, with many beautiful places of interest including the nation’s biggest pagoda and the Unesco World Heritage-listed Trang An grottoes. Tam Coc and Mua Cave and Cuc Phuong, Galaxy cave .... and an optional choice for who loves biking. 07:30 Tour guide of Paradise Indochina Travel pick you up from your hotel in Hanoi and start our 2.5 hour journey to Trang An complex - Halong Bay on land. 10:00 Arrive at Trang An then take a boat trip to visit Trang An Grottes: Sang Cave, Toi Cave, Ba Giot Cave, Nau Ruou in mystery and wildness, see scenery of mountain and rivers. 12:30 Have lunch at local restaurant with some local special dishes food. After lunch we ride a bike to Mua Cave. On the way cycling you explore real countryside images of Vietnam. 15:00 Arrive at Mua Cave and climb up on 500 steps to top for panoramic view, from here you can view the most beautiful places in Ninh Binh town and limestone mountain along to the south of Vietnam. After visiting the cave we continue ride the bike through the fields and countryside peaceful scenery to reach Tam Coc. Check in Hotel / Bungalow this time for relax. 18:30 Have dinner at local restaurant. Free time discovery in Tam Coc by night. 8:00 After breakfast, check out your hotel then leave for a boat dock for boating to Thien Ha Cave (Galaxy cave located in the hillside of the Tuong Mountain range). To reach this cave, tourists have to be on bamboo boat to float over a small canal among the paddy fields before coming to the land and reach the cave. After strolling along the curling rocky path of the foot of mountain for 500m, visitors would come to the cave gate. 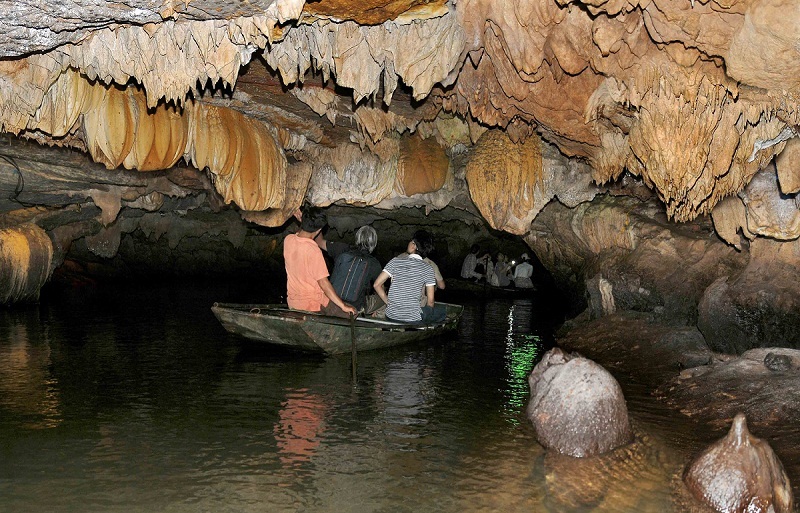 Visiting to the water grotto, travelers would float on the underneath river which is name Galaxy which appears with curling line under thousands of sparkling stalactites which suddenly on the right above curl of the cave ceiling. There are also many stalactites under various shapes, which need to be named. In the peaceful place, visitors would feel the sound of the oar striking clearly, the sound of water drop and thousands of bats inside the grotto. After that, get back on car driving to Cuc Phuong. Then we will have lunch in a restaurant of Cuc Phuong National Park nearby. 13:30 Start trekking in Cuc Phuong national park. It was officially opened in 1960 as the first national park in Viet Nam. There are plenty of plants and mammals living in the park. There are an estimated 2.000 different species of flora and the 450 species fauna account for 38% of the national fauna. Keep following the popular trails will lead you to serveral ancient trees called by the name Cho Chi 1000 years, the oldest tree in the forest. 16:30 Get on car and come back to Hanoi for drop off at your hotel. End of service. 02 bottles of water daily. Tour Price: 180$/ pax . Please contact us to get a best offer.